I would have loved to have seen the pitch for Splatoon. “Here’s a shooter where you don’t actively go out to shoot your opponent but instead cover the whole map with ink. The team with the most ground covers, wins. Oh, and you’re a squid.” Someone at Nintendo decided that it was crazy enough to work and you know what? I’m glad they did. The typical online match revolves around two teams of four battling it out in “Turf Wars” where you have to cover as much ground as possible. It’s a refreshing take on the rather old and tired out shooter genre and it’s one that works surprisingly well. Like really well. Turf Wars are immense fun and have an addictive edge to them, and you often find yourself saying “just one more game” only to still be playing a few hours later. It’s addictive enough to make you notice that it’s the only game mode so far (as of writing), which is a little annoying and questions the longevity of the whole game. Thankfully, new modes are coming in the future, but you can’t help but feel that Nintendo had to get something out there with this game. Away from the hectic online battles, there’s the single player, which is a cross between the gel levels in Portal 2 and the Super Mario Galaxy games. The campaign is essentially a 3D platformer with 3rd person elements thrown in. You find yourself trying to fight back against the Octarian forces through a series of levels which get more and more challenging. The first 20 levels or so should be a breeze for anyone with a bit of gaming experience, and will probably enjoy the challenge of the last few levels on offer. Splatoon happily takes elements from the 3D Mario series and adds it’s own unique twist to them. The boss battles feel rather much like bosses from the Zelda franchise, with one boss requiring you to throw a bomb in it’s mouth… It’s a solid campaign with additional gameplay features, like sponges and ink-rails, and makes it feel like a different experience from the online. The campaign also rewards you for beating bosses by offering you a new weapon for every one defeated. For those with amiibo, the challenges are considerably harder, especially the inkling challenges were you’re forced to play missions with limited ink. The challenges are just the single-player levels with different weapons of restrictions. For example, some challenges will have you play through with the Kraken special and have you try to complete the level in a set time. Others will have you use the roller or the chargeshot, depending on what amiibo you scan in. The rewards on offer are decent, but if you don’t have the amiibo, you’re not really missing out on too much. The controls are fairly 50/50. There’s the option to use the gyroscope which, surprisingly works well, and is the best way to quickly move the cross-hairs as well as being highly accurate. There’s also the option to playing traditionally with the stick, which isn’t as accurate or as quick but much more accommodating to those not used to motion controls. That said, the motion controls is an art that you have to teach yourself, but with an open-mind and a bit of practice, you should easily be nailing it and is the best way to play the game. 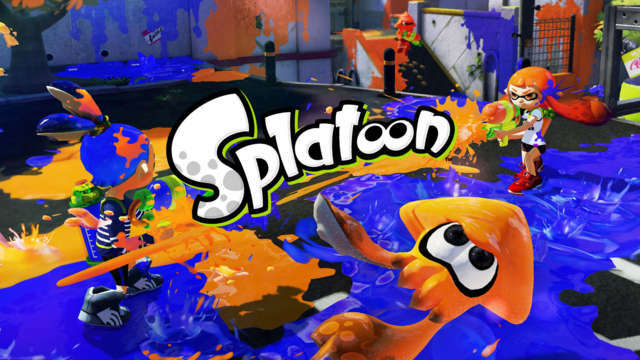 The main issue with Splatoon is lack of launch content. After playing for 30 hours to write this review, I’d reached the level cap, finished the story and made myself over a 100k in the games currency. While the Turf Wars are pretty fun, I’m finding my enjoyment of doing the same thing over and over starting to fade. It’s not helped by the map rotations being every four hours, so you’re stuck with the same two stages for an age, and if it happens to be a level you’re not too keen on, the enjoyment starts to seep away. You get the feeling that Splatoon was rushed out of the door because the project couldn’t keep running internally. It’s missing game modes that most shooters have and it’s missing the variety that a modern game needs to have to stay relevant. This will all be remedied in the coming months but for now it’s becoming a bit of a tedious task to keep playing by myself online. All in all, Splatoon is probably the most fun I’ve had in a while playing a game and, considering I’m not a fan of online games, I actually enjoyed playing online with other people. The servers need a bit of work, but you’d have to be daft to think Nintendo would get it spot on from the get-go. The single-player will keep you entertained for a decent amount of time and experimenting with different loadouts and threads can pass the time too. The lack of content and variety of modes on offer at launch is staggering but it’s fun enough for you to get 30 hours or so without starting to get a bit annoying. If you’re looking for a bit of fun and don’t mind playing with other people, then Splatoon is essential, not just as a Wii U purchase, but for everyone.